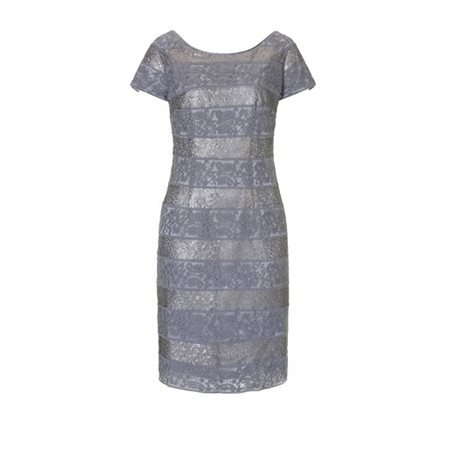 Vera Mont has created this stunning lace layered dress in a gorgeous pewter shade. The dress has been layered with the outer layer made from delicate lace and sequin fabric with the under layer created from silver satin fabric. The dress falls to the knee with a slit at the back, it closes at the back too with a long concealed zip. The elegant scooped neckline is edged with silver satin and the capped sleeves are ever so delicate. This is a fabulous dress by Vera Mont, it would be a great choice for a mother of the bride or mother of the groom and we have an elegant pewter clutch bag that would be perfect to accompany it.